Although Alexander Mack was behind not just one but several new denominations, he did not want that reputation. He was so determined not to be honored as a founder of new sects that when he lay dying, he said, "Now when I am gone, don't mark my grave, or they might sometime want to erect a monument...." His children protested and finally he agreed to allow them to remember him with a small slab. Mack died on this day, February 19, 1735, in Germantown, Pennsylvania. His pilgrimage from Germany to the graveyard in Germantown was the result of faith. 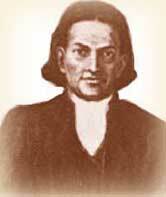 Mack was born near Heidelberg, Germany in 1679 and baptized as a baby in the Reformed church. He had intended to go to college, but the death of an older brother forced him to work the family mill. An avid reader, he never stopped educating himself. The state churches of Germany seemed lifeless to Mack. And he was appalled by the way "Christian" armies butchered one another in Europe. Influenced by the religious awakening known as Pietism, he saw that Christianity must be more a matter of the heart than of the head. He studied the Bible and became convinced that the established churches were not following its teachings. Although there was a law against leading private Bible studies in the home, he defied it. One day, while he worshipped with a number of others, authorities broke in and threatened to arrest them all. Mack and his wife fled with their children. They found refuge in Schwarzenau, a village near Marburg. From the Bible, he concluded that the only meaningful baptism was by immersion of believers who were old enough to understand the act. He and seven others, who had been baptized as children, decided to obey Scripture as they understood it. Mack pleaded that they draw lots to see who should conduct the ceremony, not wanting to be known as the founder of yet another religious group. But in August 1708, after one of the other believers baptized Mack in the Eder river, he baptized the rest. Because of their views on baptism, these brethren became known by such names as Dunkards, Tunkards, and Old Baptists. Mack insisted that followers of Christ must count the cost. They must be prepared to suffer the loss of everything for the sake of their Lord. At love feasts, these brethren would sing hymns, examine their consciences, and wash one another's feet. They followed this with a simple meal. Soon their numbers had grown to 200. Persecution again threatened. The non-violent brethren fled to the Netherlands where Mennonites helped them. While he was in the Netherlands, Mack's wife and a young daughter died. Circumstances changed. Led by Mack, 59 families of these brethren migrated to Pennsylvania, rejoicing in their new-found religious freedom. Again Mack's influence was great and the Dunkards founded several congregations. To these early congregations, several of America's Brethren denominations trace their roots and practices. "Alexander Mack." Christian Hall of Fame. http:www.cantonbaptist.org/halloffame/mack.htm). Kermit, Eby. "The Brethren Genius." Religion in Life 22 No 1 (Winter) 100 - 109. "Mack, Alexander, Sr." Mennonite Encyclopedia. a comprehensive reference work on the Anabaptist-Mennonite movement. Hillsboro, Kansas: Mennonite Brethren Pub. House, 1955 - 59. Meier, Marcus. "Mack, Alexander." Kirchenlexicon. http://www.bautz.de/bbkl/m/mack_a.shtml. Mead, Frank S. Handbook of Denominations in the United States. Nashville: Abingdon, 1981. Stoffer, Dale R. "A Swiss Brethren (Anabaptist) Source for the Beliefs of Alexander Mack and the Early Brethren." Brethren Life and Thought 48, 1/2 (Winter/Spring 2003) 29 - 38. Willoughby, William G. "Honors to Alexander Mack." http://www.cob-net.org/mack/honors.htm.